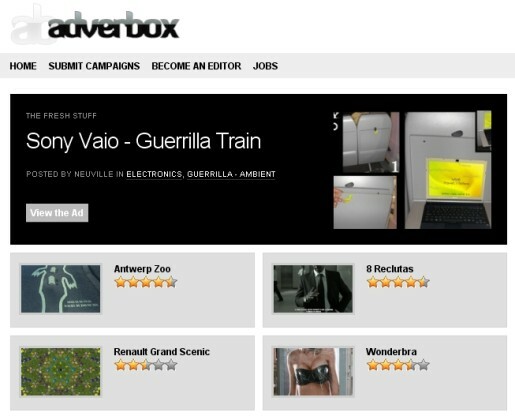 Adverbox Advertising Blog is today’s Site of the Day. Run by Giuseppe Contaldo (Neuville), in Galatina, Italy, with help from a few contributors/editors. When did you start Adverbox? What inspired you to start? I started posting ads some years ago, it was 2004, on mokabreak, a blogspot hosted weblog. I started that as one of the first collaborative blogs out there in the internet. In those years I was a member of yayhooray, a nice community site, and so hired people from there, each one with a specialty. So I started the threads of the “Ad-a-day” that were the base for AdverBox. After some years I switched to the new domain, AdverBox.com, bought a sql space, installed WordPress and continued posting ads. Was there a particular piece of work that got you going? No particular pieces. If you browse the archive at the box there are great ads from the past. The goal was to post good ads, not the fresh ones. In years Ad Agencies started submitting stuff. I’ve a huge backlog (over 300 submission emails) and I’m studying a way to make this done. In the meantime the blog was growing in audience and I invited people to join as editors (there’s still the button on the site). People registered, but only 3 or 4 of them post regularly. I notice you’re using a star rating system. Which plugin are you using? How have you developed the site over time? WordPress, WordPress, WordPress. It is the best software out there, it’s impressive how many people are involved in coding and helping that community grow. It’s better than professional (expensive) content management systems we use daily at our jobs. I’ve started learning something about php and mysql, and started designing the themes from myself.